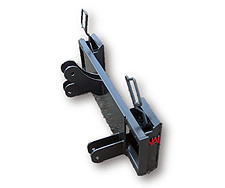 Your tractor or front end loader can be easily converted to a skid steer quick attach with NAI's conversion plates. Call concerning your needs and the measurements of your machine. NAI's conversion plate enables you to turn your tractor or front end loader into a skid steer, giving you the freedom to use NAI's attachments without purchasing a skid steer. Your tractor can be used for many tasks with our vast array of skid steer attachments.